This curious feature of Maori carving has been the subject of much controversy and is variously seen as a bird-headed man, a bird, a serpent, or a human figure in profile. The name is all that has been left to us by authoritative Maoris. Williams' Dictionary of the Maori Language gives the following meanings for manaia: a grotesque beaked figure sometimes introduced in carving; ornamental work, a lizard; the sea-horse; a raft; and, as an adjective, fastidious. It is interesting that in Samoa the word (with the causative prefix) fa'amanaia means to decorate or embellish. In Niue the cognate word fakamanaia means the same. As the main use of the manaia is to embellish the principal figures, it seems very likely that the name simply means "embellishment" or "decoration". A study of Maori carving quickly brings out two outstanding features. The first is that, apart from the naturalistic figure, every type of full-faced figure has a manaia to match. The second feature is that the head of the manaia can, in each case, be recognised as half of the head of the appropriate matching figure divided down the middle of the face. This obvious fact does not appear to have been noted in a scientific paper until Archey drew attention to it in 1933. It is quite clear that most, at least, of the manaia in carving are grotesque human figures shown in profile - see the poupou in the porch below. This view is supported by the fact that full-faced figures and manaia may be used interchangeably in certain types of carving. A good example is the pare, or door lintel, which almost invariably has three main figures. These may be three full-faced figures or one central full-faced figure with a manaia on either side. 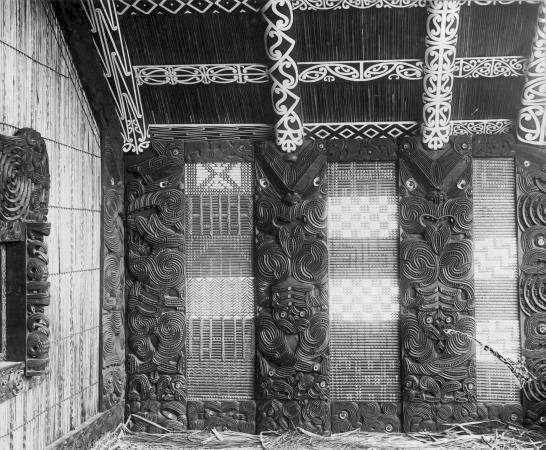 tukutuku panels (ornamental lattice work) and kowhaiwhai (rafter patterns). The poupou nearest the inner wall of the house is a manaia. Many experts strongly contend that the manaia is a bird-headed man, or even a bird. There is very little traditional evidence to support either view and, as Archey has pointed out, the manaia normally has the distinctly non-avian characteristic of teeth, or at least one tooth. The very fact that only the name has come down to us from the ancient carvers seems to imply that there was nothing extraordinary about the manaia and that it was just another example of the primary element in carving the human figure. The manaia is a most versatile creature of the greatest use to carvers, as it can be distorted or mutilated, almost at will, to fit any space which needs to be filled. It may simply be an eye and a mouth, with or without a nose, tongue, or teeth; it may be a head and one arm, with or without hand; it may have two arms and no body, one arm, one leg, and a body, or the full complement of body and extremities. Manaia may be used to form the hands or fingers of large figures, or sometimes even the arms or feet. In most carving compositions, the background between the high-relief figures is filled in with manaia engaged in the most amazing contortions. It is common for a part of one manaia to form part of another one; for instance, the curved arm of one may also be the mouth of an adjacent manaia. Occasionally a manaia may look very like a snake, but what appears to be a snake body may simply be a curved arm with the hand not shown. There are no terrestrial snakes in New Zealand, and sea snakes are rare.